Serious vascular embolic complications may occur with any kind of filler, even if its biocompatibility is otherwise good. Injections of dermal fillers have shown tremendous year–on- year growth since their introduction. Although dermal necrosis has been reported with HA fillers, this adverse event is typically far less severe with HA fillers than with non –HA fillers (with prompt diagnosis and treatment). 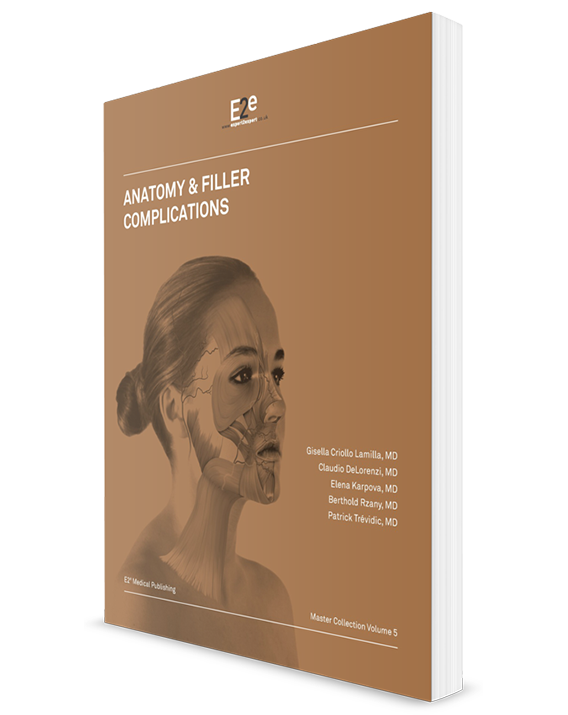 Anatomy and Filler Complications emphasizes on the importance in training and educating physicians. As a full time aesthetic plastic surgeon, I looked somewhat skeptically at fillers when first introduced in the 1990’s. At about the same time, botulinum toxin was beginning to gain attention but I perceived short-sighted “group-think” between different clinical societies, each claiming territory in the aesthetic marketplace, each reluctant to share ideas with the others. Today, young people have thankfully adapted well to this new spirit of cooperation. Personally, I recall that I was very skeptical, wondering who on earth would spend a few hundred dollars for a temporary lip enhancement, or to temporarily rid oneself of frown lines for a few months. I completely underestimated the public’s fear of surgery, and underestimated by several orders of magnitude the degree to which people would flock to this new treatment paradigm. Soon, other fillers were introduced, each claiming to be superior, just as several problems became more prevalent, and more evident. I began collecting cases and speaking about adverse events at various local meetings, attracting referrals. Years passed and I became a national “troubleshooter” for end users in Canada for the largest filler companies. I published several articles in peer reviewed journals, sharing what I had learned to help others deal with adverse events. This experience led me to meeting the people involved with this present work. “This book provides a concise reference summary of the majority of adverse events that one is likely to encounter in clinical practice. There is an excellent, up to date look at the specialized filler anatomy of the face along with clear illustrations for rapid comprehension of the clinical significance of the facts. We cover both the common and uncommon complications with an emphasis on clinical management, best practices, and prevention. Introduction of hyaluronic acid (HA) products. After the early introduction of filler products capable of slightly deeper placement, the potential for sculpting and adding volume as routine treatment was rapidly realized by practitioners. Upon the introduction of hyaluronic acid (HA) products, there was a veritable explosion of development. For the first time, we had the convergence of products that could address both static and dynamic rhytids. Injections of dermal fillers have shown tremendous year-on-year growth since their introduction. It is important to remember that serious vascular embolic complications may occur with any kind of filler, even if its biocompatibility is otherwise good. In fact, the ready availability of hyaluronidase (HYAL) allows physicians to readily reverse the ischemic effects of intra-arterial HA fillers on the skin, provided the diagnosis is made on time. Prevention is therefore the only recourse, as it will be discussed in this chapter. A clear, concise organization, simple to remember is essential which will help for an orderly diagnosis and management of complications. Group 1 involves errors of technique which will become more infrequent with developing skills. An area that is commonly incorrectly treated is the infraorbital region. Attaining sufficient detailed knowledge of the three-dimensional anatomy is absolutely necessary to avoid errors in the exact placement of the product. Group 2 involves any complications that has inflammation as its primary features. This category of complications will be discussed in chapter 4. Group 3 involves vascular complications. This category of complications is the subject of chapter 3. In order to obtain the skills to become reasonably proficient at these aesthetic procedures, trainees require to grasp the artistic concepts of beauty, balance, and symmetry, the manual dexterity essential to complete the treatment. With excellent training and hands-on experience, most physicians can learn to be safe and effective practitioners, provided they have the necessary prerequisite skills. Knowing which patients are likely to be a problem (especially patients who have body dysmorphic disorder) for your practice is critical information that is ignored at your peril. Always use checklists when performing your patient evaluation and especially when discussing risks and complications. There is only one opportunity to obtain pre-treatment photographs, therefore standardized photographic documentation prior to treatment is not an optional component. The facial artery, which originates in the external carotid, provides the main blood supply to the face. The facial artery enters the face from the submaxillary region, running along the lower edge of the mandible and curving upwards to its lateral aspect just in front of the antero-inferior angle of the masseter muscle and under the platysma muscle. The facial artery has a very sinuous course. According to certain authors it continues its tortuous course between the modiolus and the nasal ala, travelling up from the medial side of the nasolabial fold (NLF) in 42.9% of cases, arising from the lateral side of the NLF in 23.2% of cases, crossing the NLF laterally in 19.6% of cases, and crossing the NLF medially in 14.3% of cases. In most cases, the subalar or inferior alar artery arises from the facial artery but sometimes from the superior labial artery. Some authors consider the angular artery to most often be a small branch rather than a main continuation of the facial artery. Variations of the facial artery: The rule rather than the exception. The standard description of the termination of the facial artery in the angular artery at the medial canthus and its anastomosis with the dorsal nasal branch of the ophthalmic artery does not always represent the most frequently found model. Some authors have reported that the facial artery most often ends near the base of the nasal ala, after giving off the superior labial artery, where it may divide into the subalar artery (or inferior alar artery) and the lateral nasal artery (or superior alar artery). Although some studies have reported that the most common distribution model is the classic course for the facial artery, which becomes the angular artery at the medial canthus of the eye in 68% of dissections, other publications have described a much lower frequency, with percentages of 12%, 22%, 24%, and 36% in their series. The maxillary artery is one of two terminal branches of the external carotid artery and its diameter is approximately 2.75mm at its origin. The superficial temporal artery is the most external and superficial terminal branch of the external carotid artery, reported by some authors to have approximately a diameter of 2mm, or 2.52mm by others. The ophthalmic artery, which originates in the internal carotid, enters the orbital cavity through the optic canal, accompanied by the optic nerve. It gives off numerous collateral branches: central retinal, muscular, ciliary, lacrimal, supraorbital, posterior ethmoidal, anterior ethmoidal, meningeal, superior and inferior medial palpebral, and ends at the medial angle of the upper eyelid as the supratrochlear and dorsal nasal arteries. The periorbital and nasal regions constitute zones with a high risk of embolic complicationsduring aesthetic filler injections. Description of the veins that concern the face and that might represent an anatomical danger zone for aesthetic injections to the face. The internal jugular vein is the continuation of the sigmoid sinus. It is contained in the carotid sheath, initially with the vagal nerve and internal carotid artery, and then with the common carotid artery. It receives many tributaries draining the brain and certain superficial parts of the face and neck. The supratrochlear vein arises from a network of veins communicating with the frontal branch of the superficial temporal vein. The existence of anastomoses between the facial vein and cavernous sinus via the ophthalmic veins is of great importance since they may facilitate the spread of a thrombophlebitis due to infection of an area of the face. The angular vein is formed from the anastomosis between the supratrochlear and supraorbital veins at the inner angle of the eye. It then becomes the facial vein. The existence of communications between the facial and endocranial venous networks plays a key role in the etiopathogenesis of craniofacial thrombophlebitis. The external jugular vein is formed in the thickness of the parotid gland by the junction of the posterior branch of the retromandibular vein (which is in turn formed by the confluence of the superficial temporal and maxillary veins) and the posterior auricular vein. The external jugular vein provides drainage for most of the scalp, and for certain superficial and deep lateral parts of the face and neck. The anterior jugular vein originates in the suprahyoid region from the superficial submental veins. The anterior jugular vein drains part of the anterior region of the neck and submental region. It retains large anastomoses with the internal and external jugular veins. The nerves involved in the sensory and motor innervation of the face are mainly the trigeminal nerve (Cranial Nerve V) and the facial nerve (Cranial Nerve VII). The sensory innervation of the face is provided mainly by the trigeminal nerve (CN V). It divides into three branches that innervate all the integuments of the face and other deep structures. The facial nerve is a mixed nerve, since it has motor, sensory, and vegetative function. It innervates all the muscles of the face and neck except for the levator palpebrae superiorismuscle. It provides sensitivity to part of the concha of the ear, and to the external auditory canal and tympanum. It provides taste sensation to the anterior two-thirds of the tongue via the chorda tympani, and controls secretion by the lacrimal and submaxillary and sublingual salivary glands. Despite the variability of precise locations of blood vessels in the face, it is very useful to have in mind an image of the approximate boundaries of the major vessels. The regions that are most commonly involved in serious adverse events following injection of dermal fillers include the glabella and brow region, the nose, the periorbital areas of the cheeks, and the nasolabial fold. It is useful to consider three main vascular regions in the face: The internal carotid region, the external carotid region, the combined region. Small branches supplying the dermis can also have anastomoses to the deeper vessels, and so even when treating relatively safe superficial rhytids, the risk if distant injury is not zero. The entire glabellar region between the eyebrows should be considered a high-risk zone at all needle depths, whereas the forehead area, lateral to the glabellar region, is low risk in the subgaleal plane from approximately 15mm above the supraorbital rim to the hairline. Any color change in the glabella should be considered dangerous as it means there is a vascular obstruction of the nasal area. The author has named this the “Pope Hat Sign”. The entire nasal area, and in particular the dorsum and radix are high-risk areas. Filler treatments of the nasal dorsum should be done exceptionally slowly with tiny aliquots, and deposition directly upon bone or cartilage in the midline. The labial area is usually divided into the upper and lower labial areas but we shall consider them as one region since they each show similar patterns of injury. The labial arteries travel in the region of the red lip posterior to the wet-dry line. Small amounts of filler typically only affect the lip itself. Larger volumes can cause serious degrees of obstruction because of retrograde flow to the facial artery. The failure of laboratory confirmation of the external pressure hypothesis in conjunction with pathological evidence of intra-arterial filler, confirms the clinical opinion that accidental intra-arterial injection of dermal filler is responsible for the pathology in the vast majority of cases. All preventive strategies involve reducing the risk of intravascular injection of filler material. With the tiny amount of dermal fillers typically used, intravenous injection will likely not have any serious effect, partly because of the extreme redundancy of the venous system, and secondly because of the amount of filler injected. However, even a small amount of filler has the potential to cause serious ischaemia of the dermis, or worse. It must be remembered that most regions of the human face have very extensive collateral blood vessels, with significant anastomoses between regions. On the one hand, this may provide a pathway for filler to travel distant areas and cause unexpected problems. On the other, anastomoses will provide alternative pathways for blood to reach tissues that would otherwise be completely obstructed. There is a qualitative difference in high-volume embolism (HVE) versus the much more common (but still rare) low-volume embolism (LVE). The author readily admits that almost all of the vascular events observed consist of the LVE type (probably more than 95%), and so LVE is the prevalent form and the one that the reader is most likely to encounter. HVE events are basically preventable when following best practices, however, and are most unlikely. The main problem with treatment of HVE resulting from use of HA fillers is that treatment with Hyaluronidase (HYAL) product is typically not immediately effective when embolic events involve a large volume of tissue. The non-zero risk assessment is the main take-away message of this chapter. An injector must have intimate knowledge of the detailed vascular anatomy of the face in three dimensions, especially the surface anatomy. He must know the depths of the vessels from the surface, however it is practically speaking impossible to know in every specific case which arterial pattern is present. We can only estimate the areas that are higher risk, and those that are lower risk. For example, blunt cannulas are less likely to penetrate a vessel. Because there is less bruising and less discomfort with a cannula than a needle of equivalent diameter, some doctors may preferentially use cannulas. Injection techniques: There are several methods of injecting fillers that can be used to some benefit. This part will examine each injection technique and discuss the risks and benefits of each. Almost all cases of acute vascular ischaemia resulting from filler injection occur within moments after the treatment. However, there have been cases reported of a delayed onset of ischaemia, when the signs of vascular compromise happened several minutes after the end of the treatment. Visual loss is possibly the single most dramatic and feared complication of filler embolism. The possible causes of loss vision may be grouped according to the presumed location of the obstruction. Diagnosis of vascular compromise, once established, should take priority over all other activities at the clinic. Pain is almost never currently reported in acute events. Note the colour of the skin, and in particular, note the presence of livedo reticularis. A small dose of lidocaine missed with HYAL greatly improves the patient experience and if, anything, lidocaine will act as a vasodilator. The filler “crash cart” consists of only HYAL and knowledge, as all the peripheral techniques previously described are no longer needed. Unwanted results after the injection of filler are usually due to overcorrection and/or erroneous placement. What is defined as overcorrection depends on the cultural environment. An aesthetically preferred result in one part of the world might be considered an overcorrection in other parts of the world. Photographs might be helpful to assess and discuss the treatment strategies for asymmetries and overcorrections. Patients and physicians are aware of common adverse reactions (oedema/swelling, haematoma). Their frequency and severity are usually assessed in clinical trials. Rare adverse reactions can be categorized as abscess-like reactions, ulcers and nodules which appear in most cases in a delayed manner. In the case of an unclear medical history, it is recommended to identify the relevant filler first. It might avoid erroneous reports to the regulatory agencies and help decide on the best possible treatment strategies. It should be clear that all the general rules for cleanliness should be followed when injecting fillers. FILLER COMPLICATIONS: IS THERE A WAY TO PREVENT VASCULAR COMPROMISE WITH 3D-ANATOMY? The use of facial filler injections has increased dramatically over the last 10 years and so has the incidence of complications. The main and most serious adverse event is vascular compromise. The most feared consequences are devastating: blindness, skin necrosis and stroke. The physician should be able to recognise the first signs of complications and take an adequate management strategy to address them urgently. The best approach is prevention and for us, the best prevention starts with a good knowledge of 3D-anatomy that will help us to avoid not only the dangerous areas and but also the dangerous plane. The classical three main dangerous anatomical zones for filler injections referenced in the literature are the glabella and forehead, nasal and labial areas. The understanding of 3D-anatomy is essential to avoid vascular complications. In fact, vessels can travel through tissues at different depths along the same pathway (Figure 1). Figure 1: All vascularisation of the right side of the face after skin and superficial fat compartments removal. The glabellar area, in particular, has limited or no collateral blood supply. Thus, any obstruction of the blood supply will tend to result in dermal injury. The overall pattern of the zones of injury seen in the glabella is typically vertical and fusiform, due to the orientation of the blood supply. In the lateral or mid-eyebrow region of the forehead, the zones of injury tend to be triangular in shape, with one point of the triangle inferiorly near the presumed area of obstruction, and spreading in a triangular shape towards the hairline . Several studies have showed that the glabella was the most common filler injection site triggering blindness . Accidental intra-arterial injection with a filler product may lead to an obstruction of the central retinal artery. The central retinal artery is a very thin branch of the ophthalmic artery; it enters the optic nerve and reaches and supplies the retina. This embolism is associated with retrograde blood flow, through the anastomoses between the supraorbital, supratrochlear and ophthalmic arteries, provoked by strong pressure exerted on the syringe piston, leading to immediate and nearly always irreversible blindness in the affected eye [1-2]. Ophthalmic artery branches, derived from internal carotid artery, and the frontal branch of the superficial temporal artery, originated from external carotid artery, provide cutaneous blood supply to the forehead, glabella, nose and periorbital region. The supraorbital, supratrochlear, central retinal and dorsal nasal arteries are some of the branches of the ophthalmic artery (Figure 2). Figure 2: Vascularisation of the forehead and glabella. The hook holds orbicularis oculi muscle showing the anastomosis between intra and extravascularisation of the orbit. The supratrochlear artery exits the superomedial orbit through the frontal notch, traverses the corrugator muscle and travels upwards deep to the orbicularis oculi and frontalis muscles. Approximately 15 to 25mm above the orbital rim, the artery pierces these two last muscles to run into the subcutaneous plane . The supraorbital artery emerges from the orbit through the supraorbital foramen and divides into superficial and deep branches. The superficial branch runs upwards and pierces the frontalis muscle and galea aponeurotica, 20 to 40mm according to some authors [1-3] and 15 to 20mm according others  above the orbital rim to becoming subcutaneous. The deep branch runs laterally above the periosteum to supply the pericranium of the superior orbital rim. The supraorbital artery anastomoses with the supratrochlear, angular and dorsal nasal arteries and with the frontal branch of the superficial temporal artery. This region of 15mm just above the supraorbital rim is thus a high-risk zone because of these blood vessels. At vertical levels above this area, the subgaleal tissues are low-risk, because they are relatively avascular. In other words, the lower risk strategy involves injecting deep in the upper forehead (below the galea) and injecting very superficially in the lowest zone, and taking extra precautions in the deep to superficial vascular transition zone. Several publications reported the nasal area as the main cause of tissue necrosis and the second cause of visual loss after the glabella zone . The entire nasal area, and in particular the dorsum and radix, are high-risk zones. The rich communication between the external and internal carotid vascular network in these regions constitutes a danger of embolisation towards the central retinal artery (with its risk of blindness) or towards other intracerebral arteries (with the risk of stroke) [1,6,7] by retrograde propagation mechanism from the filler injection site. The nose is another special region where blood can be supplied by the internal, the external carotid arteries or most commonly by both (Figure 3). Figure 3: Vascularisation of the nose with the subalar artery and the lateral nasal artery going to tip. The facial artery (external carotid system), as it passes the nostril, gives off the subalar or inferior alar artery but sometimes the latter arises from the superior labial artery . Supplying the nasal ala with branches that become more superficial, the subalar artery also participates in the rich arterial anastomotic system of the upper lip . Because of its anatomical position in the upper third of the nasolabial fold (NLF), the subalar artery constitutes an anatomical danger zone for the filler injections often requested in this area of the face . In its course towards the medial canthus of the eye along the lateral edge of the nose, the facial artery gives rise to the lateral nasal artery or superior alar artery, which can sometimes branch from the superior labial artery. This artery supplies the dorsum of the nose and nasal ala, and anastomoses with the arterial plexus of the nasal tip [1,6,8]. For some authors, the lateral nasal artery is the main terminal branch of the facial artery rather the angular artery, the latter being a small and thin artery [8-10]. For others  the angular artery is the main continuation of the facial artery. It continues its course in the nasojugal fold above the levator labii superioris alaeque nasi and orbicularis oculi muscles. While running towards the inner angle of the eye, the angular artery runs just below the tear trough, and then passes between the two insertion heads of the depressor supercilii muscle, becoming deeper, and finally anastomosing with the dorsal nasal artery, a branch of the ophthalmic artery. In the literature, several authors  have reported that the facial artery most often ends near the base of the nasal ala, where it may divide into the subalar artery and the lateral nasal artery in other studies , the most common findings were those in which the facial artery ends in the lateral nasal artery. The dorsal nasal artery, branch of the ophthalmic artery (internal carotid vascular network), emerges from the orbit and gives off a collateral branch to the lacrimal sac before dividing into two branches: (i) one anastomoses with the angular artery and (ii) the other runs along the nasal dorsum. Rich anastomoses with the supratrochlear, contralateral nasal dorsal and lateral nasal (a branch of the facial artery) arteries supply the nasal bridge and nasal dorsum . Since the vascular network of the nose is superficial, and beneath the dermis, filler injections should be performed deep to the musculoaponeurotic layers, in the preperichondrial and preperiosteal planes to avoid injury or cannulation of vessels. It is recommended to inject small amounts of fillers with extreme caution in patients with previous rhinoplasties since the anatomy could have been modified and the residual sclerosis makes the vessels less mobile in their environment which increases the risk of being cannulised . When injecting, block distal vascular flow with your non-dominant hand. Small amounts of filler typically only affect the lip itself. Larger volumes can cause serious degrees of obstruction because of retrograde (proximal) flow to the facial artery. Typical patterns of injury involve the upper and lower lip and the ipsilateral nasal area. Several normal variants of the superior labial artery have branches, either single or paired, to the nose. Thus some injections of the upper lip can paradoxically show an injury to the nose as a result of one of these branches (the columella, alae, or both) . The labial area is usually  divided into the upper and lower labial areas, but we shall consider them as one region, since they each show similar patterns of injury (Figure 4). Figure 4: Vascularisation of the labial area with the inferior and superior labial artery coming from the facial artery. The inferior labial artery arises from the facial artery, generally at the level of the labial commissure, but higher or lower in certain cases . It passes behind the depressor anguli oris muscle and enters the lower lip travelling between the mucosa and orbicularis oris muscle  along the level of the lower lip vermilion-cutaneous border  towards the midline to anastomoses with its homologue from the opposite side . The superior labial artery branches from the facial artery generally at the labial commissure, superior or inferior to the latter. It runs towards the midline between the orbicularis oris muscle and the mucosa usually superior to the vermilion border, at a depth of about 3 to 7.6mm to skin, until just before approaching Cupid’s bow where it becomes inferior to the border [1-2]. It anastomoses with its counterpart and forms a rich arterial arch. Several superficial ascending branches (to the skin) and deep ascending branches (to the mucosa) arise from this network, including the septal arteries, located on either side of the philtrum to anastomose with the subalar and columellar arteries. The labial arteries travel in the region of the red lip posterior to the wet-dry line. Typically, the vessel is more often found within the orbicularis oris muscle within the central third of the lip. The artery is relatively close to the mucosa (particularly in the lateral thirds), and thus it is clearly in the high-risk zone whenever filler is injected into the area posterior to the wet-dry line in efforts to evert the lip. When performing filler injection, it is more important to keep in mind the depth than the height of the artery. Over the last decade the use of facial filler injections for minimally invasive rejuvenation has been steadily increasing with the consequent increase in their unpredictable adverse events. Vascular complication can occur even when being careful and taking into account rules of safe injection: the use of a cannula is better than a needle in a dangerous 3D-anatomy, cannula / needle is withdrawn as the filler is injected depositing small amounts, injecting slowly ensuring to keep the cannula / needle in constant motion, maintaining a low pressure on the plunger of the syringe. Although loss of vision is a rare complication after filler injections, it must be noted that this adverse event can happen at any time and it is usually devastating [15-16]. It is essential that the injector should be able to quickly recognise  complications and take an adequate management strategy but prevention is better and the best prevention is good knowledge of 3D-anatomy. 1. Criollo-Lamilla G, DeLorenzi C, Karpova E, et al. Anatomy and filler complications. Paris: E2e Medical publishing / Master collection 5; 2017. 2. Scheuer JF 3rd, Sieber DA, Pezeshk RA, et al. Anatomy of the facial danger zones: maximizing safety during soft-tissue filler injections. Plast Reconstr Surg 2017;139(1):50e-58e. 3. Erdogmus S. Govsa F. Anatomy of the supraorbital region and the evaluation of it for the reconstruction of facial defects. J Craniofac Surg 2007;18(1):104-12. 4. Kleintjes WG. Forehead anatomy: arterial variations and venous link of the midline forehead flap. J Plast Reconstr Aesthet Surg 2007;60(6):593-606. 5. Ozturk CN, Li Y, Tung R, et al. Complications following injection of soft-tissue fillers. Aesthet Surg J 2013;33(6):862-77. 6. Kassir R, Kolluru A, Kassir M. Extensive necrosis after injection of hyaluronic acid filler: case report and review of the literature. J Cosmet Dermatol 2011;10(3):224-31. 7. Carruthers JD, Fagien S, Rohrich RJ, et al. Blindness caused by cosmetic filler injection: a review of cause and therapy. Plast Reconstr Surg 2014;134(6):1197-201. 8. Nakajima H, Imanishi N, Aiso S. Facial artery in the upper lip and nose: anatomy and a clinical application. Plast Reconstr Surg 2002;109(3):855-61; discussion 862-3. 9. Azib N, Charrier JB, Cornette de Saint Cyr B, et al. Anatomy and lip enhancement. Paris: E2e Medical Publishing / Master Collection 4; 2011. 10. Furukawa M, Mathes DW, Anzai Y. Evaluation of the facial artery on computed tomographic angiography using 64-slice multidetector computed tomography: implications for facial reconstruction in plastic surgery. Plast Reconstr Surg 2013;131(3):526-35. 11. Niranjan NS. An anatomical study of the facial artery. Ann Plast Surg 1988;21(1):14-22. 12. Pinar YA, Bilge O, Govsa F. Anatomic study of the blood supply of perioral region. Clin Anat 2005;18(5):330-9. 13. Scheuer JF 3rd, Sieber DA, Pezeshk RA, et al. Facial danger zones: techniques to maximize safety during soft-tissue filler injections. Plast Reconstr Surg 2017;139(5):1103-8. 14. Crouzet C, Fournier H, Papon X, et al. Anatomy of the arterial vascularization of the lips. Surg Radiol Anat 1998;20(4):273-8. 15. Lazzeri D, Agostini T, Figus M, et al. Blindness following cosmetic injections of the face. Plast Reconstr Surg 2012;129(4):995-1012. 16. Park SW, Woo SJ, Park KH, et al. Iatrogenic retinal artery occlusion caused by cosmetic facial filler injections. Am J Ophthalmol 2012;154(4):653-62.e1. 17. Rzany B, DeLorenzi C. Understanding, avoiding, and managing severe filler complications. Plast Reconstr Surg 2015;136(5 Suppl):196S-203S.